Delaware is a small state. In fact, it is the second smallest state in the United States and only Rhode Island is smaller. Delaware is not usually known as a major gambling hub but residents and visitors from neighboring states know better. In fact, despite its small size, Delaware currently hosts three major gambling facilities that feature car and horse racing as well as slot machines and the state has been established as a major mid-Atlantic gambling destination. Actually, these venues are not considered casinos in Delaware. They are technically known as pari-mutuel facilities with slots. Dover Downs Hotel & Casino � is a perfect example. This is a very big complex located in Delaware�s capital city of Dover. It consists of a gambling and entertainment venue complete with a race track that featuring live horse racing, harness racing, and a casino with over 3200 slots. For meetings and lodging you'll find a banquet facility with over 35,000 square feet, a beautiful hotel with 1600 seat ballroom (concert hall) - and eleven restaurants + bars. There is no racing on Fridays, Thanksgiving, Christmas week or on Super Bowl Sunday - always check doverdowns.com for full racing schedule. Simulcasting of thoroughbred and harness racing is offered year round on the main grandstands third floor and is open seven days a week from noon to midnight. Closed Easter Sunday and Christmas Day. 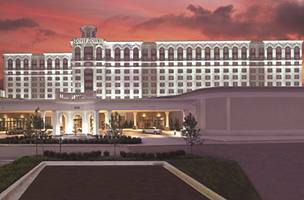 Dover Downs Hotel & Casino � features a 165,000 square foot casino with 3,200 slots. It is divided into two smoke-free slot parlors: the Terrace and the Promenade. Here players have access to some of the latest and most popular slots such as Video Wheel of Gold, Alien, Hexbreaker, Liberty Bell, Pharaoh�s Fortune, the Price is Right and Hysterical Mermaid. Slot play ranges from pennies to hundred dollar machines in the premium High Roller Section. Progressive slots are always popular due to the large payoffs. Dover Downs Progressives can pay over $1,000,000 � and this casino has progressive machines in nickel, quarter and fifty cent denominations. The casino offers a slot Play-on-Credit Option. Applying is similar to application for a loan or credit card. After an application is submitted, the casino will obtain a Consumer Credit Bureau Report and check with other gambling jurisdictions in Atlantic City, Las Vegas, etc. to see if credit has been previously established in any other casino. Once credit is approved, there are no fees such as interest or user fees and credit can be accessed at any time. Markers due can be paid by cash, personal check or tokens. Joining the Dover Downs Players Club (called the Capital Club) affords members various benefits in the form of comps which can include discounts for meals, rooms at the Dover Downs Hotel, entertainment, etc. The membership has two levels and rewards are issued based on slot play points accumulated. New members are initially issued a Gold card. Players who accumulate at least 500 points in a one year period are upgraded to a Platinum card membership. Platinum card holders are offered the same comps as those available to Gold card holders � plus additional privileges such as free valet parking, a once a day no fee use of ATM service, access to the Capital Lounge and many other rewards. Players can find out how many �comp� dollars they have in their accumulation fund by inserting their club cards into any slot machine, press the �promo� button and a comp dollar balance is shown. This is the amount available for use for meals, etc. The Dover Downs Hotel is part of the Dover Downs Complex, a luxurious facility featuring 500well-appointed rooms, which include 28 deluxe rooms for use by Platinum Club members. Deluxe rooms feature one king or two double beds and an oversized bathroom. Suites offer a spacious sitting room with one or two bedrooms and a Jacuzzi tub in the master bathroom. Special room rates are available for both Gold and Platinum card holders. Additionally, the hotel has three bar/lounges available for relaxation and beverages. Located at the South end of the slot facility floor, patrons of the Waterfall Bar can play slots without leaving their bar stools. The Garden Caf� and Restaurant features live music and dancing on Friday and Saturday evenings � with no cover charge. Overnight visitors to the Dover Downs Casino and Hotel enjoy watching the track races. Many of the hotel rooms overlook the track. Guests have also commented favorably on the spaciousness of the rooms and the smoke-free casino atmosphere. The hotel is conveniently situated between a shopping center and a mall and movie theatre, and guests have often enjoyed a break from gambling and poolside relaxation by shopping or taking in a movie. General remarks about staff courtesy have generally been most favorable. The Dover Downs Hotel and Casino regularly sponsors big name acts and concerts at the spacious Rollins Center Concert Hall that has consistently drawn sellout. crowds. Select another U.S. state for casino / gambling information :: Thanks for visiting the Delaware Gambling site - Casino Hotels, Horse Racking & Slots.